Final: Mashpee 21, Abington 20. Final play of the game — TOUCHDOWN A-B! Xaverian overcame a 17-0 deficit to come back and defeat CM (25-17) in OT. 🗣️ "These guys are the bullies of the DCL, and we just took them down." The #NERevs take aim at a vulnerable Toronto team bostonglobe.com/sports/soccer/… via @BGlobeSports . Regardless of what the ruling is, that was one hell of a play by Delvon Randall at the pylon to pick off Anthony Brown. Jackie Bradley Jr. couldn't have taken a better line to the ball. They're gonna overturn this. Still one hell of a play. 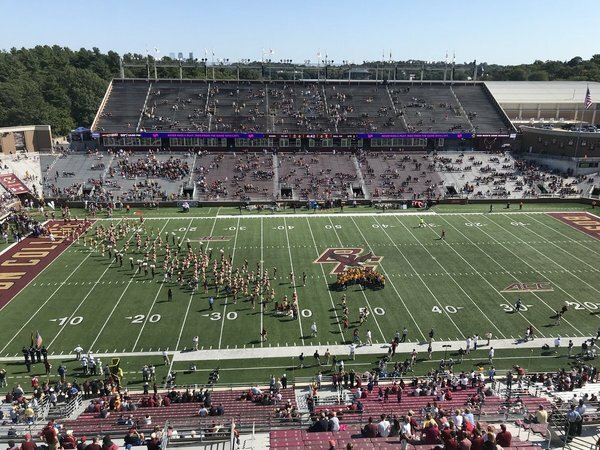 BC elects to re-kick after Temple is offsides, immediately regrets it as they fumble away the kick off that Isaiah Graham-Mobley scoops up for a TD. They're reviewing it, but if this stands it would be 15th straight game for Temple with a non-offensive TD. There better be a really, really legitimate rationale for this. Not even a conference call? Gotta say one of my favorite traditions here at Alumni Stadium is when the student section sings "Mr. Brightside". You young bucks don't understand what an all-time banger that was in my college days. It was everywhere, 24/7. Halcyon days of youth. BC's Taj-Amir Torres, pride of Amherst, with the interception and run-back to the Temple 9. Got absolutely lit up by Chris Myarick at end of play and now we're gonna have a targeting review, because Lord knows we haven't had enough of those this afternoon. Heard a rumor that if you get to five targeting reviews in a game at Alumni Stadium, your first round at Mary Ann's is on the house. Another Yeoman's afternoon for AJ Dillon. 25 car 147 yards 2 TD in the first half. Temple's Ryquell Armstead over the century mark (10 car 115 yd 2 TD) as well.